Do you owe property taxes or water and sewer charges? Are you on the 2011 NYC Lien Sale List? If you are, you only have until August 1 to make sure your lien doesn’t get sold to debt collectors! 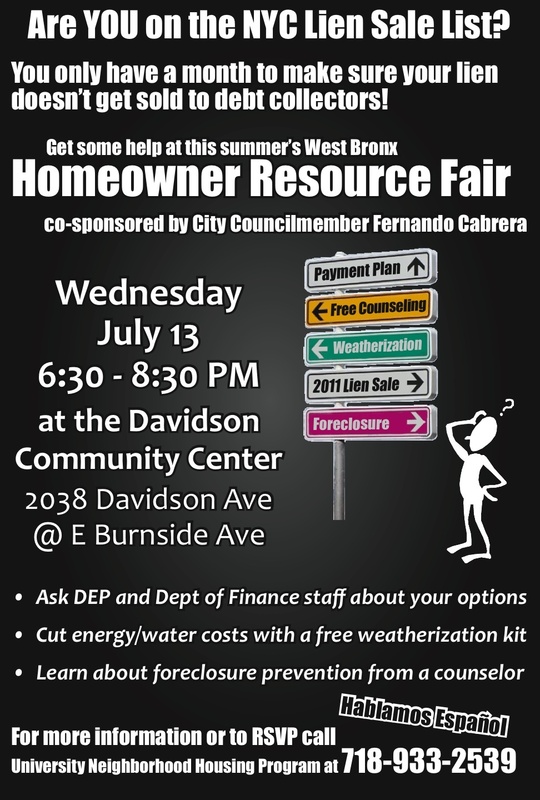 Come and get help at tomorrow's West Bronx Homeowner Resource Fair organized by University Neighborhood Housing Program and co-sponsored by City Councilman Fernando Cabrera. You will be able to ask the DEP and Dept of Finance staff about your options for affordable payment plans, removing your name from the lien sale list, and scheduling a home inspection to address leaks or issues with water meters. Come find out how to cut energy and water costs and get a free weatherization kit and learn about foreclosure prevention assistance and loan modifications from a counselor. To RSVP or find out if you are on the lien sale list call University Neighborhood Housing Program at 718-933-2539.